My kids were thrilled to test out a sack of soy Crayon Rocks from Nico & Zoe. What are Crayon Rocks ? 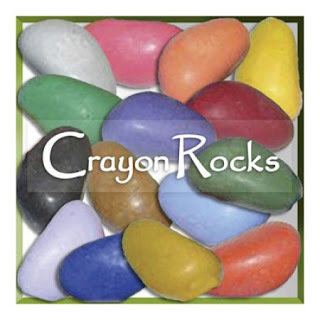 Crayon Rocks are easy to hold, encourage a proper pencil grip and develop fine motor skills. These soy crayons create beautifully textured drawings. Made of soy wax, so they go on smoothly, like pastels or paint. Kids love them too! They are easy hold and encourage the use of a tripod grip which helps develop future writing skills. These soy crayons create beautifully textured drawings. Made of soy wax, so they go on smoothly, like pastels or paint. I packed theses crayons in my purse or diaper bag when we are going out and about. A piece of paper is always easy to find and this way I know my boys have something to keep them busy if needed . Soy crayons are made from renewable soybeans grown in the USA and are colored with natural mineral powders. They are non-toxic and conform to ASTM D 4236. 3+ years, once your child has stopped putting toys in the mouth. These are just below the choking hazard size. Buy: You get 16 Crayon Rocks stored in a 4" square box, protected by a sliding clear cover. Price is $8 and sold at nicoandzoe.com. My grandkids love to color when they are with me. These soy crayon rocks would be a delight for them. These are great crayons. I've worked in a preschool classroom and the tripod grip is always something children have difficulty with. These are perfect to help with that! I love these! I want a bag for myself. You always find the coolest places on the web. I love the Art Cards Collections and the Big Day Chains, Countdown Days 'til Kits. Brings back memories of red and green holiday chains from my youth. These are so cool and I would rather my nephew carry around these stones in his pockets than the rocks he picks up everywhere he goes. I also like them being non toxic and eco-friendly. Plus just plain different and fun!! !